The primary reason to buy a pedigreed cat is because there is some characteristic of the breed — its coat, look or personality – that a person admires. Persians have long, luxurious coats and very mellow, laid-back personalities. Abyssinians have a short, easily maintained coat, and a busy, inquisitive personality. 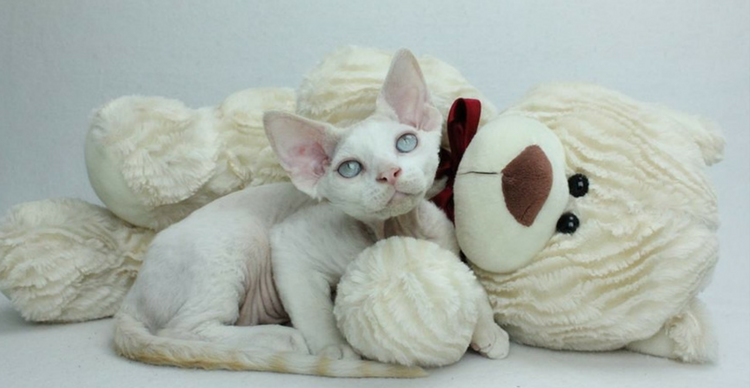 The Devon Rex is popular for several reasons — it’s short, curly coat and minimal shedding are distinctive characteristics; the Devon is not hypoallergenic, BUT… persons allergic to other cats or animals can tolerate a Devon. The Devon’s elfin face is virtually unique among cats, and the Devon’s highly curious, active and talkative nature is prized by many admirers of the breed. When purchasing a pedigreed cat, you get much more than a piece of paper (the pedigree) — you also get an right to make certain expectations of the cat’s looks, personality, and characteristics that you don’t get with non-pedigreed cats. When you purchase a cat from a responsible and reputable Breeder who is active in the showing community, you should get a cat from a line whose ancestors were judged as to how well they met the standards of the breed, and which has been part of a program designed to breed healthy and robust examples of the breed in question. You will get a cat from a Breeder intentionally weeding out undesirable characteristics or issues from the line. You will know the “story” of your kitten’s family line, and your cat will be registered with a cat organization as a purebred.